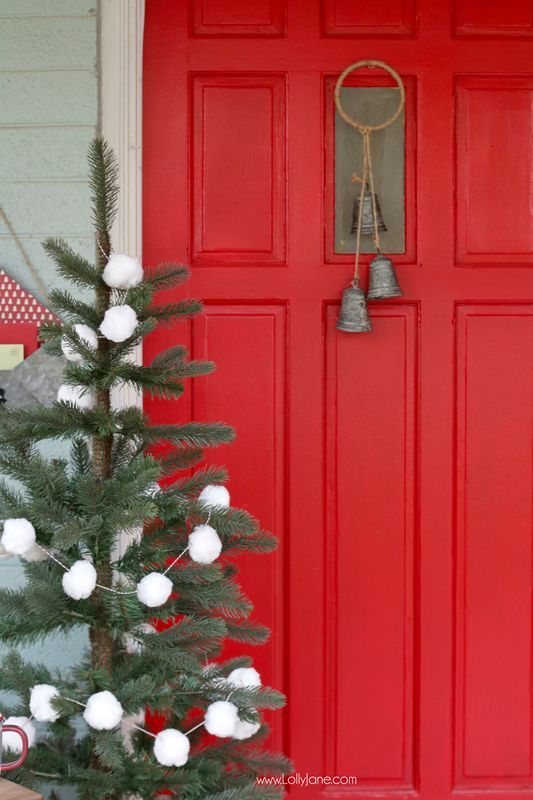 Kelli took the plunge and painted her navy blue doors the most perfect Christmas red hue and instantly we got the itch to decorate for the upcoming holiday. 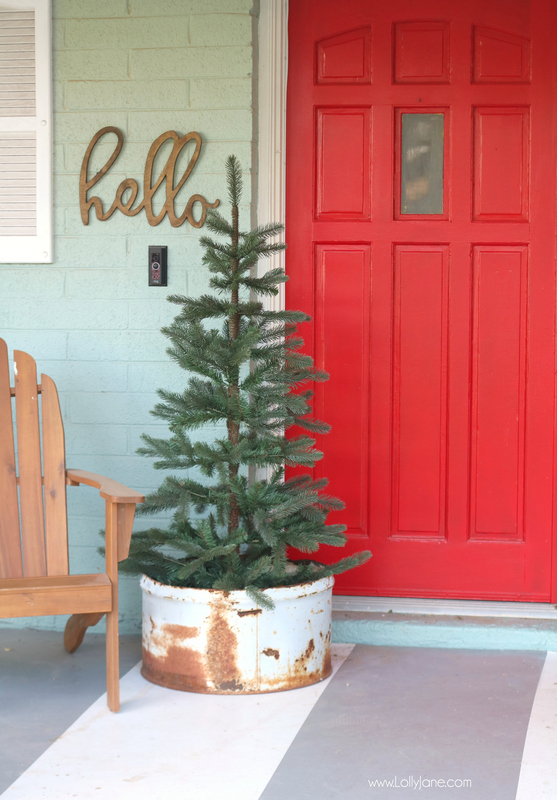 As you guys know, we absolutely LOVE shopping JOANN‘s for the latest in seasonal decor so we grabbed a shopping cart to find the perfect pieces to accent these doors and dress up Kelli’s new faux Christmas tree that greets her guests. 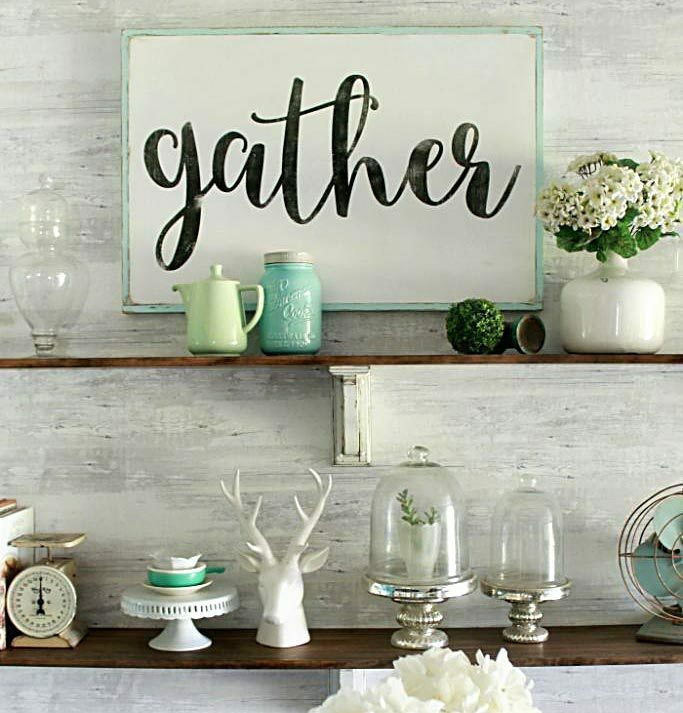 All you need is a handful of must-haves from JOANN‘s and about thirty minutes. Yes, really! Unwrap all pom pops and set them in a pile. 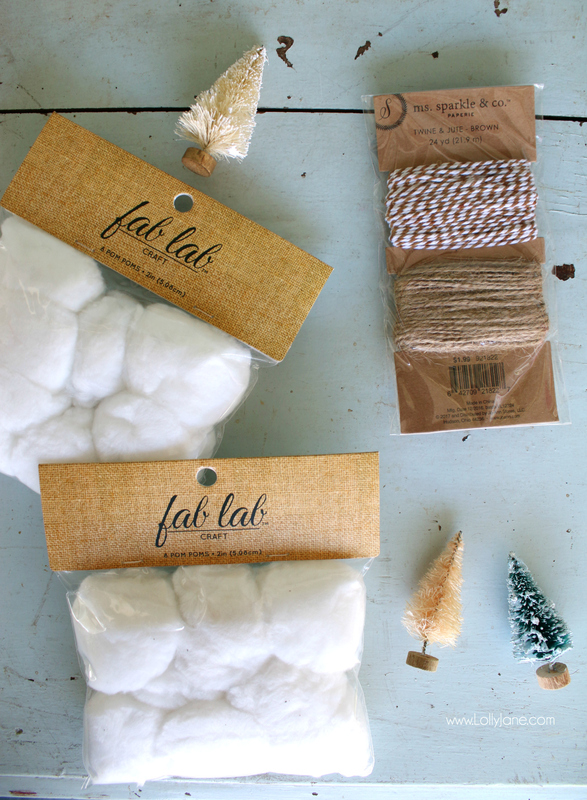 String the end of bakers twine or jute (we used the pretty gold twine) with a needle. 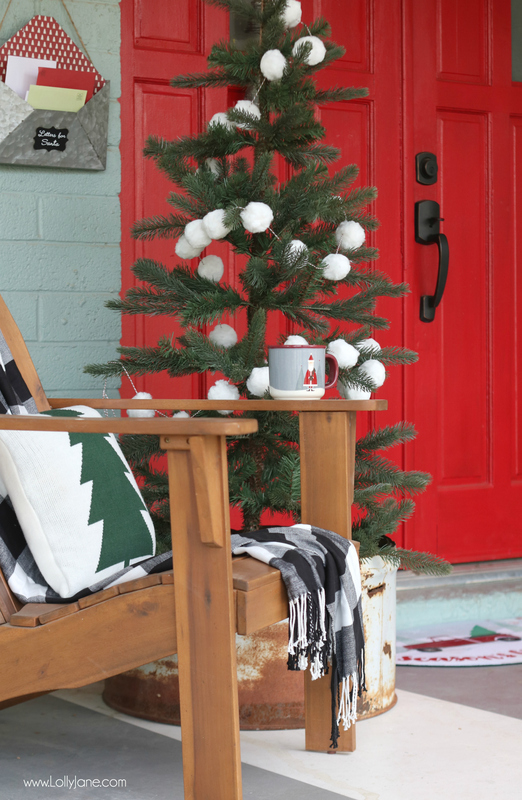 Hang across your Christmas tree to give it the cozy snowball look. 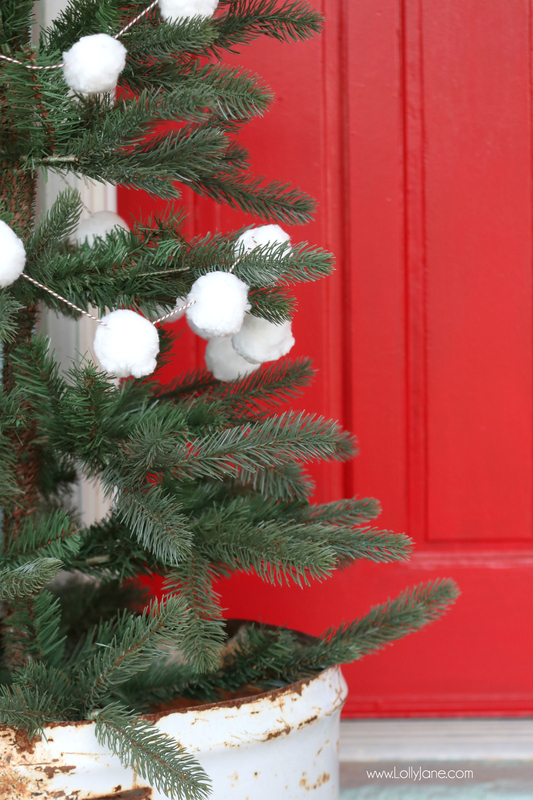 Look at those cute puffy balls up close… so festive and makes the green branches really pop! You know we love mixing old with new and the soft texture of the pom pom’s against the rusted tin really add character to this space. It coordinates perfectly with the bell wall decor that I’m using a door wreath! 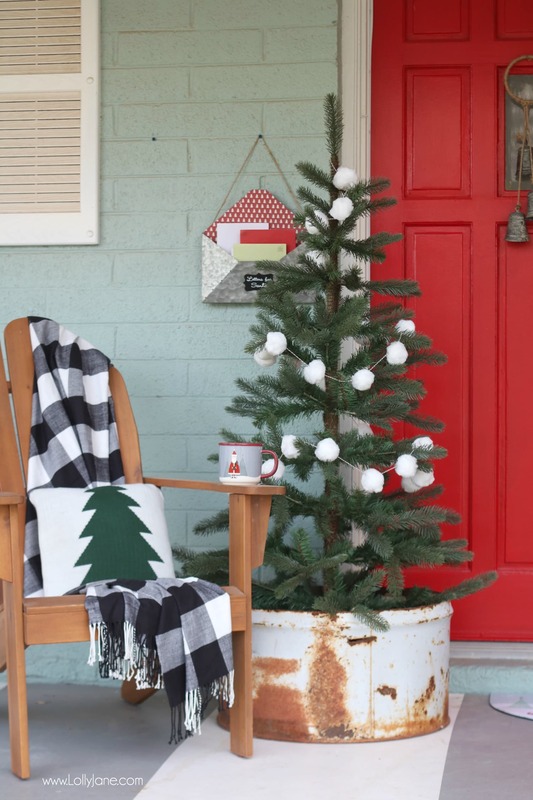 I am loving the pairing of the classic black and white meets red and green, with the bright poms especially! 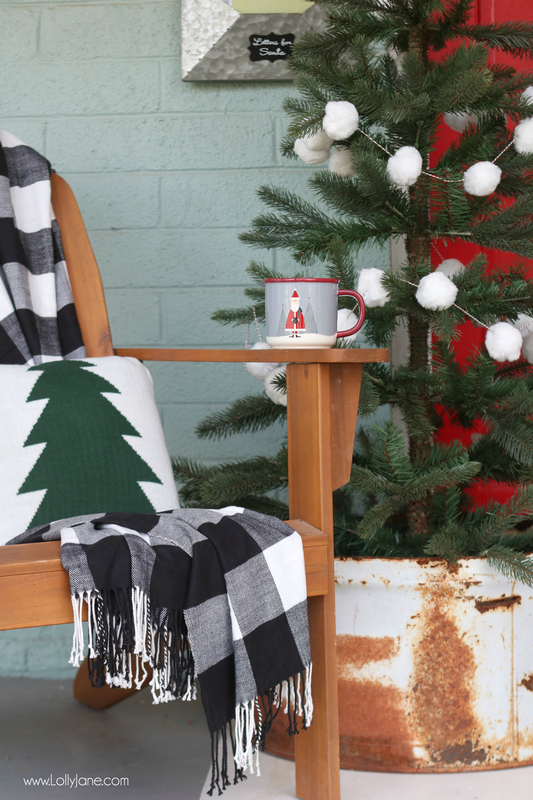 The white poms coordinate perfectly with our new plaid throw. 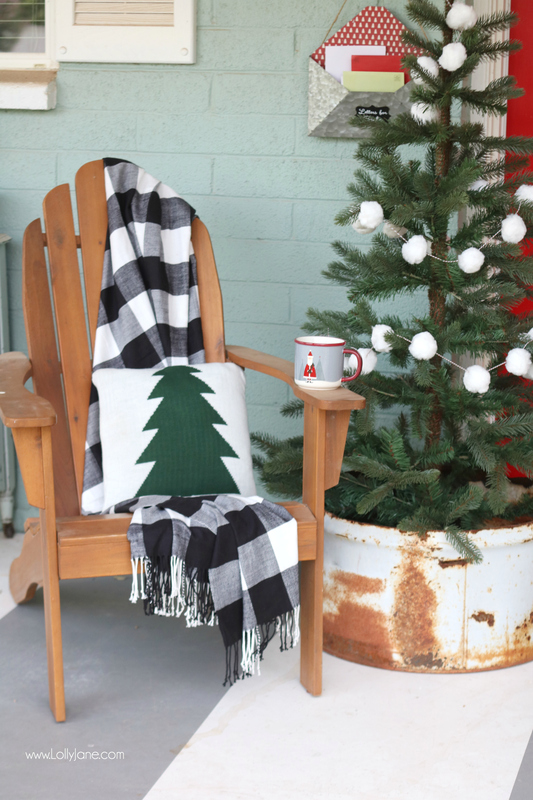 You can snag the plaid throw + matching pillow in a set at JOANN’S, such a great bundled deal! Can you even with this vintage looking Santa mug? We found him in the seasonal section of JOANN’s and he just jumped in our cart! 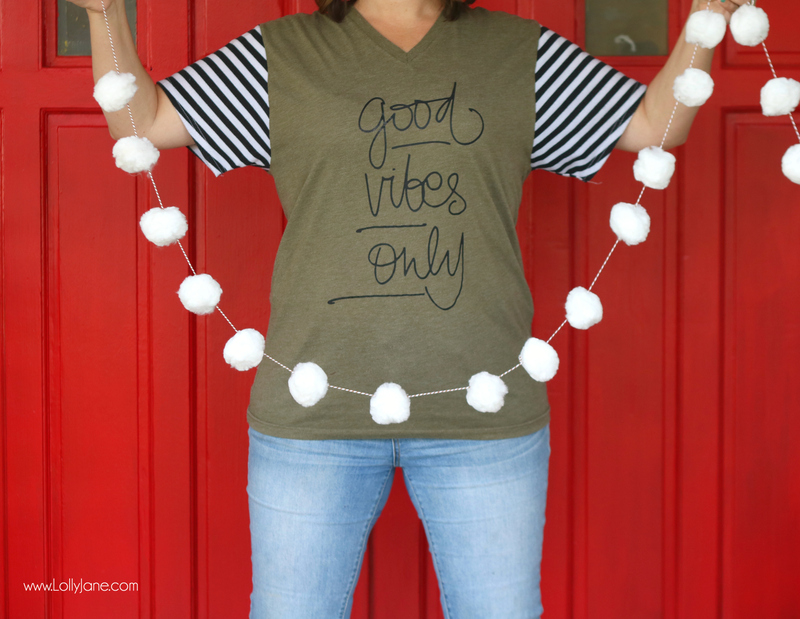 This DIY pom pom garland is great to make with your own kids of any age; when they’re little you can let them pull the poms out of the bag and hand them to you as you string them along or, as in my case, you let your teenager help while you watch. 😉 Haha! Regardless of age, our kids love to check out because they can get a treat from around the JOANN’S register and I am able to use my coupons so we both leave happy! 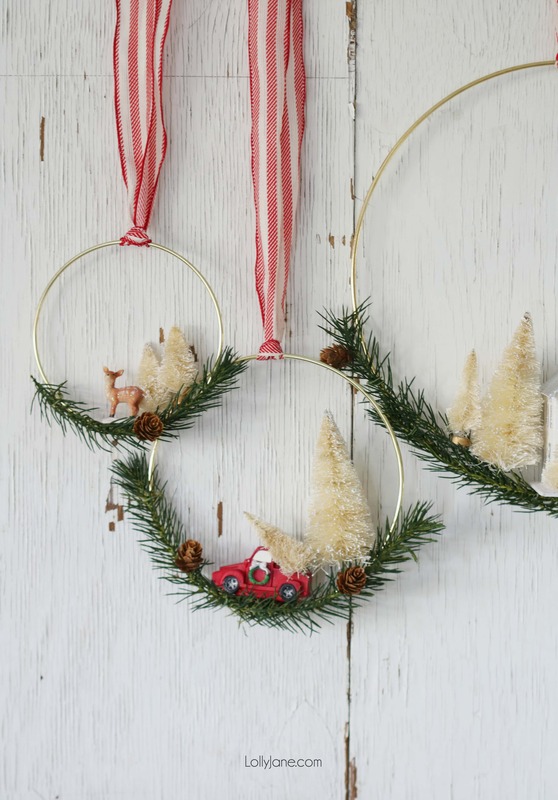 Check out our other DIY project after a JOANN FABRIC and CRAFT store run, our Bottle Brush Christmas Wreaths…. 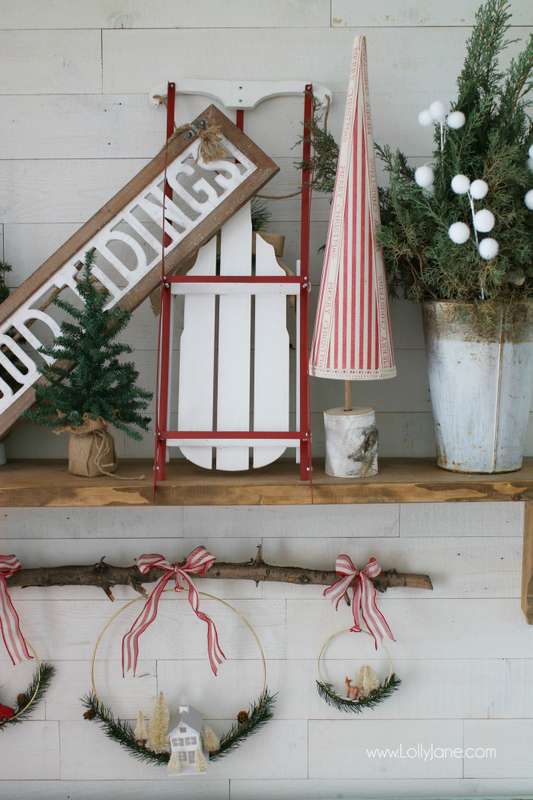 …or our DIY Merry Christmas Cones on our beautiful sled theme mantel! Thank you so much, it was such a fun project! 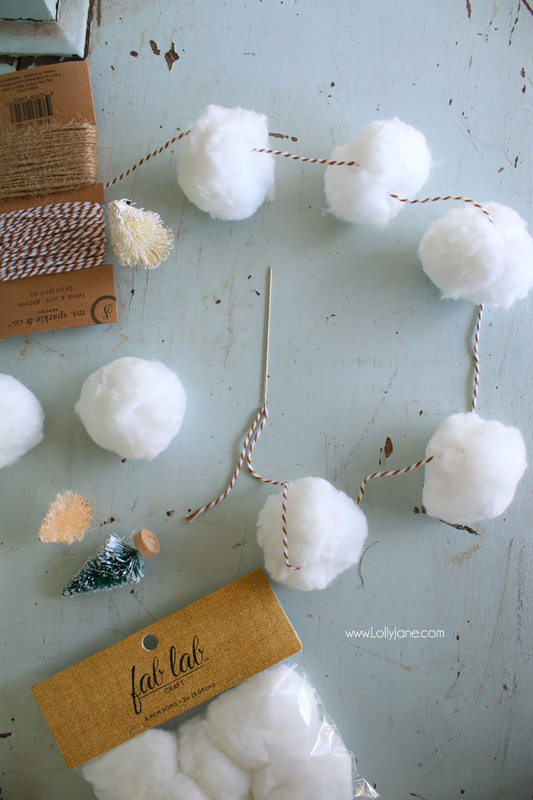 I love all of this and the poms are just the right size. What a treat for the neighbors to see this every day during the holiday season. Thank you for sharing with us this week at Celebrate Your Story and we hope you will join us again next week. Is this a real tree or artificial? It’s so adorable!